The March 2008 issue of National Fisherman has arrived in my mailbox and inside is the conclusion to Spike Walker’s new true-life story, Staying Alive. To read my post on part one of the story, please see “New Story by Spike Walker in National Fisherman Magazine,” which I posted here on January 17, 2008. It’s refreshing to read a story like Staying Alive because it is fluid writing that’s awash in authenticity. 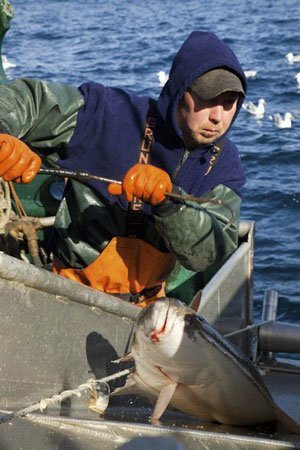 There seems to be more writing than ever about commercial fishing these days by people who are not actually commercial fishermen or even come from fishing families. It takes a guy like Spike to write something that industry insiders can both respect and enjoy. I appreciate the fact that when I sit down to read something by Spike Walker, I won’t have to cringe as I read. I can read with confidence, because I know that he will have captured the setting, the family, the fishery with the kind of credibility that only comes from years (if not decades) of working in, and writing about, the industry. Readers won’t be disappointed with the conclusion to Staying Alive. Spike’s use of dialogue rings true throughout the narrative, and the painstaking use of detail in his writing had me going back through the story more than once just to see how he does it. I won’t spoil the final paragraphs, but suffice it to say, his description of the Miss Kim (the crab boat around which the story is centered) at the end of the story is haunting. The image will stay with me for a long time. I’ve heard that one of the first rules of blogging, if you are also a “real” writer, is to not let your blog take over your “real” writing. For example, if you consider yourself a real writer, you have to be careful not to spend more time writing and posting your work on your own blog than you do working on legitimate assignments or projects, no matter how fun and tempting your blog is. I finished a deadline early today, and I am currently waiting for a call-back, so I am now writing and posting something on my blog without guilt. I’ve been eager to let you know about another “fishwife” reference that I recently stumbled upon. Something I enjoy while George is away fishing is spending my last waking moments each night reading books. I recently finished a book called Year of Wonders. It is a work of historical fiction that centers around a housemaid in an English village that lost most of its population to the bubonic plague in 1666. It’s one of the most well-written and, well, troubling (in a good literary way) books I’ve ever read. I chuckled ever-so-slightly to myself over the use of the term “fishwife” and knew I would report the finding here as soon as I had the chance. I can honestly say that as…spirited as I may be at times, I have never actually screamed over anybody, and certainly not another fishwife. It’s a known phenomenon that when one is in the market for a new car, and that person has in mind the exact car that he wants, he suddenly begins to see that make of car everywhere in town. I wonder if it is the same with “fishwife”. Now that my attention is turned to the term, I seem to see it here, there, and everywhere. Then again, maybe I’m just keeping a subconscious eye out for it. Either way, it always proves amusing. And who can’t use a little more amusement? If there is one thing I do understand about raising children, it is the importance of trying your best to create a loving, predictable, and stable home environment. 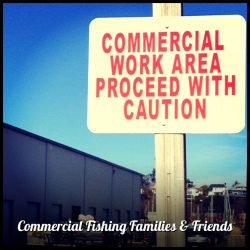 When you have a commercial fishing husband and father that comes and goes at irregular intervals, it is especially important to create an environment that will cause the least amount of stress in the children. The building of a loving and steady home in the midst of uncertainty could even be considered a fishing mother’s greatest life’s work. I’m always open to learning new things, and I do love to read. About a year ago, I bought a book that I thought might help me personally create the kind of environment in which I want my children to dwell. The book has proven, in fact, to be of value. 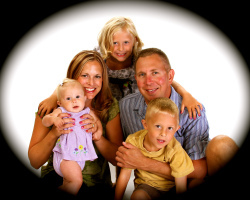 It reminds us that our children are constantly watching what we do and the way we live our life. Our children need to know that we will be happy when we see them. We create the atmosphere of our homes with our attitudes. We give expecting nothing in return. We should never give away to others what we have not first given away at home—kind tones, patience, help, cheer. Ever notice the difference in the tone you reserve for strangers and the tone you use at home with your family? Whew, that was an eye-opener for me. When it comes right down to it, the person responsible for creating the quality of life (stability) in the fishing family is…the wife and mother. She sets the mood and the atmosphere inside the home. We want the mood inside our home to be warm, positive and loving, right? Don’t we want our homes to be a place of refuge for each member of the family? The author of the book gives a real-life example of a wife (the wife of a minister, actually) from long ago who, instead of building this type of a home, figuratively tore it down. The paragraph is, admittedly, comical. (That poor guy. And my husband thinks he has it bad?) The point is clear. But besides all that—can’t a fishwife ever catch a break? “Bye-bye, Dada, bye-bye,” she said as we opened the book and began to read. National Fisherman has a surprise for its readers this month. 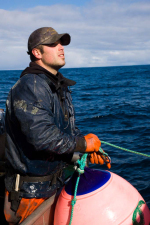 Spike Walker, writer of the famous book on commercial fishing in the Bering Sea, Working on the Edge, has written a new story entitled Staying Alive. Part one of the story is published inside the current issue of the magazine, with the conclusion set to be published in next month’s issue. 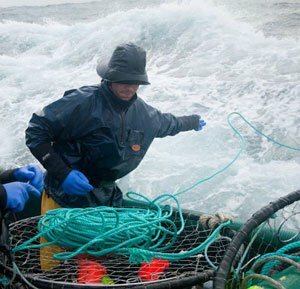 The true tale centers around an Ilwaco, WA commercial fisherman’s horrific struggle at the mouth of the intimidating Columbia River during the winter Dungeness crab season of 1980. This is a story I couldn’t wait to read because it is written by Spike and because I am so familiar with all of the locations he so beautifully writes about in the set-up to the piece (it is the most well-written lead-in to a story I’ve read in a while–he perfectly captures the setting, the family at the center of the story, and the fishery). 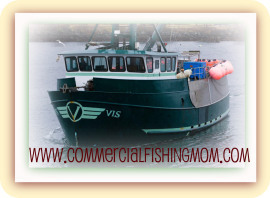 My husband is, of course, a commercial Dungeness crab fisherman in the area, and we spend a lot–make that a quite a lot–of time on the Washington and Oregon coasts. I consider Long Beach, Ilwaco, and Astoria (and actually, even Westport) my favorite stomping grounds for both work and play. I met the impressive Spike Walker on two occasions; once at Fish Expo in Seattle a few years ago, where he signed my copy of another of his books, Coming Back Alive, and at the Fisher Poets Festival in Astoria, Oregon, where he was kind enough to give an essay of mine a read and some feedback. 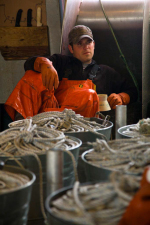 I also had the pleasure of interviewing him for a story I wrote for National Fisherman about the infamous Elbow Room bar in Dutch Harbor (which I believe has now closed its doors). In addition, Jerry Fraser, editor of National Fisherman, writes a nice introduction to Spike’s latest story in the front of the magazine. So, go get your copy, because you are in for a treat this month (and next). 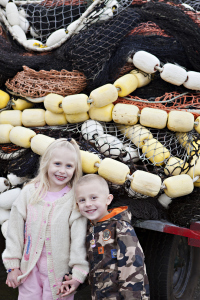 The Oregon Sea Grant published a booklet a few years back entitled Adapting to Change—Fishing families, Businesses, Communities, and Regions. 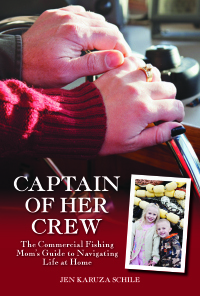 One of the topics covered in the booklet is Connecting with Fathers at Sea. 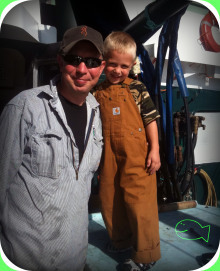 The article (“Fathers and Children through the Ages”) includes pointers on how to help your children stay connected to their commercial fishing fathers whether those children are infants, toddlers, preschool, in middle childhood or teenagers. The article offers tips on how to help your children cope with the stress of having a father that comes and goes, comes and goes. Ideas for infants and toddlers (of which I have both) include having large pictures of dad’s face nearby, maybe even a wedding photo so the child can see mom and dad together. Dad’s voice could be recorded for the child to listen to in his absence, or a video could be taken and showed to the toddler, perhaps even a video of Dad on his boat. Here in our home, we have used most of these ideas. I have a big picture of George, Eva, Vincent and me as my computer screensaver, and Eva knows how to crawl into my office chair, click the mouse and see her daddy.”Dada!” she exclaims each time his big, smiley face magically appears. 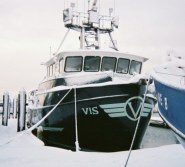 I also have a picture of our boat displayed at her eye level, and I save all of George’s messages on our old-fashioned answering machine so that Eva can go over, push “play,” and hear his voice again and again. It does break my heart, though, when Eva wakes up in the morning and looks immediately for her daddy inside the house. It brought a tear to my eye the other night when, as we read a book, Eva became especially excited over a picture of a little girl named Grace receiving a big hug from her father. 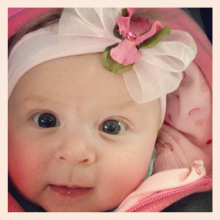 When Eva looks at me and asks “Dada?” my response is always the same. “Daddy’s working,” I say first, and then pause. “He’s fishing!” I say at last, like it is the most exciting and wondrous thing in the world. I attended a reading at a local bookstore this weekend, something I always enjoy and recommend to everyone. Readings are usually free, last about an hour, have an aura of intellect and celebration about them, and are just simply a pleasant way to spend part of an evening. I went with my five-month old, Vincent, to hear Croatian-American author Toni Mirosevich read three moving selections from her book, Pink Harvest. Mirosevich grew up in the Croatian-American fishing community in Everett, WA, and is now a professor of creative writing at San Francisco State University. Before leaving, Vincent and I cornered the author and asked her to sign our copy of the book. Mirosevich wrote a wonderful message to me in which she acknowledged our similar Slav commercial fishing backgrounds and wished me luck with my own writing harvest. It is one of the nicest messages I have received in a signed book. My dad had pre-ordered a copy of Pink Harvest, but left to go catch Dungeness crab (for a couple of weeks) with George before his copy of the book arrived. Hence, he also missed the reading, which he too would have enjoyed, as there were fellow Slavs in attendance and the mood was light. Q: How did the Slav and the Pacific Northwest fishing communities influence your temperament, your way of viewing the world? I’ve always felt this quote described what growing up in the Slav community felt like. Until I went to public school, the world I knew was all Croatian-American; the fathers fished, the mothers stayed home and raised the families. Everyone knew everyone else and everyone else’s business, too. I knew of no other world. It was as if the entire world was that “tiny street” in Everett or on that 14th Street dock. As I grew up I became more adept at moving between two cultures or straddling two cultures — the Slav world and “the other world,” which was anything outside of Slav world. Adept at listening in on the two languages spoken at home, familiar with eating Dalmatian brodet one night — the one fish dish I know how to make — and having American macaroni and cheese the next. You can read the full article about Toni Mirosevich here, or you can access her personal website if you would like additional information about the author. I tell you—what a day. It’s 7 p.m. and both kids are in bed (granted, one is talking on her plush cell phone in her crib and the other is crying from his crib for me to come back and get him—but at least they are in bed). “Bach?” Eva asked after dinner. “No book tonight, sweetie,” I said. She didn’t press the matter. She’s all but begged me to put her to bed since 4:30 this afternoon anyway, so I’ve finally granted both of our wishes. I’m sure Vince will settle out soon. Regardless, Momma is exhausted in need of a break. I taught Jazzercise yesterday (always an exhilarating respite) and the final song in my set was “Wonderful Tonight.” I certainly don’t feel wonderful tonight, however. I might feel marginal after a bath. 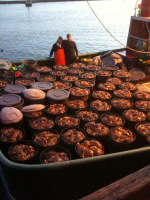 Yesterday, George delivered several thousand pounds of Dungeness crab to a local buyer and came home for the day. He asked, since he was available for the afternoon, if I’d like to run errands together or if I’d like some time to myself. To his dismay, I immediately chose Time to Myself. I turned the children over and headed directly to my home office. I had serious work to do, and I needed to focus. So, I went down the hall, turned left into our bedroom, turned right into our closet, sat down in a wooden chair and opened up my laptop—my office. Eva cried loudly from her bedroom on the other side of the wall, so I got out my nature sound machine and turned it full-blast on Rain. I found my favorite radio station (from Beaverton, OR) online and “clicked to listen live.” Loudly. I gave my work a quick once-over, clicked “send,” and took the baby from George. You might be wondering what important work I had to complete. I pitched an idea to The Writer Mama herself, Christina Katz. She wasn’t immediately sold. She asked me questions. “It’s tough love, sister,” she wrote. She asked me to write a paragraph on the matter. I wrote. She asked for a re-write. I re-wrote. I waited. Then, finally, good news. In a special note tonight, I want to thank everyone for their views of this blog during the past week. The last few days shattered all previous Highliners and Homecomings viewing records, and it was exciting to monitor. I don’t know where, or from whom, all the hits are coming from, but it’s been touching. So, thank you very much, and as always, feel free to leave your comments. I have the world’s most amazing thesaurus–the “Bartlett’s Roget’s Thesaurus,” to be exact. The bottom of the cover of my hardback volume reads, “The marriage of two great names in reference.” It’s over 1400 pages and of great value to me as a reader, writer, and general lover of words. When I was brainstorming names for this blog, my family and I threw a lot of different words and combinations of words out there. “Jen’s Jellyfish Journals,” was one. “Bunks, Buoys, and Babies,” was another. “Dock Talk,” and “Fish Tales,” was two more. As I told my good friend, Heidi, the fun was endless. Finally, one evening I cornered George and asked for his input. I wasn’t sure. The word was a little too bland, a little too self-explanatory. I assumed that “fishwife” simply meant what it implied; a lady married to the world of fishing. Whether that marriage was by boat or cannery, whether it was on shore, at sea, or by some other means, I didn’t know. So, I did what anyone would do. I grabbed my thesaurus and looked it up. The following is what I read. Well, my goodness! I read the definition out loud to George, who of course had a tremendous laugh over the matter and reiterated what an excellent title for my blog it would still make—more now than ever, it seemed. Later, I asked my mom (also the wife of a fisherman) if she was familiar with the official definition of fishwife. I started to explain what I’d discovered, but she cut me off. “Oh yes,” she said, and nodded knowingly. “It’s terrible. Fishwife. Not good.” She looked at me again, this time with pity and maybe even a trace of disdain at my ignorance. It is a small children’s book about a poor fisherman and his wife who live in a cottage by the river. One day, the fisherman catches a magic fish who offers to grant the fisherman a wish if he sets the fish free. The fisherman says there is nothing he needs, and sets the fish free anyway. Of course, when the fisherman returns home that evening, he is in big trouble. His wife certainly has a wish; a nicer house! The fish grants the wish. The fisherman is satisfied, but his wife isn’t just yet. Oh, no. She sends her husband right back to that river and demands that the fish put her in a castle. She sends him back for a third time with the demand that she be made queen. Next, that the sun not be allowed to rise or set without her permission. And so the story goes—the wife becoming more and more greedy, the fisherman more and more sad and confused. In the end, the wife concedes her greed and returns to feeling happy and satisfied with the life she and the fisherman have made; a life that includes a small cottage in which to live and a nice, plain fish for dinner. It’s a useful tale, but here’s my question—why is the book called The Fisherman and His Wife? Why not The Plumber and His Wife? Or, The Professor and His Wife? The Real Estate Agent and His Wife? The Policeman and His Wife? The Accountant, the Teacher, the Contractor?